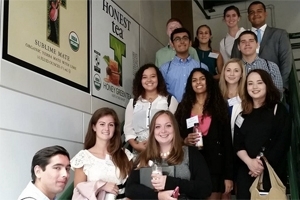 Students visit business in the DC area to begin building their professional network. Capital Connections is Kogod's annual introduction to area businesses for incoming students. Local companies open their doors for tours, presentations, and Q&A sessions about their operations. Being an incoming freshman, I wanted to do a Welcome Week program to meet new people once I arrived at college. As an economics major hoping to start my own business, I thought that Kogod's Capital Connections was a good opportunity. I am very glad I made the decision to participate, because it was truly an incredible experience. Over the course of the two day session, my classmates and I were taken on a journey to several local businesses, including the Big Four accounting firm KPMG, the younger startup companies, Snagajob and Social Driver, the entrepreneurial incubator, 1776, and two excellent local restaurants, Chef Geoff’s and Spider Kelly’s. Each of the businesses had their own unique culture, from open floor plans, yoga balls, and the energy of young entrepreneurs, to the traditional professional environment in more established institutions. Each company discussed what they looked for in employees, with some searching for traditional business skills in finance and accounting, while others emphasizing communication and writing skills. As an aspiring entrepreneur, the advice that resonated with me the most was from other business innovators, who stressed that drive and determination were critical to their success. While each company had its own personality and we received various kinds of advice, the one thing that all of them stressed was the importance of networking. Thanks to Capital Connections, after just two days, I have already begun developing a network not only within Kogod, but in Washington, D.C. as well.